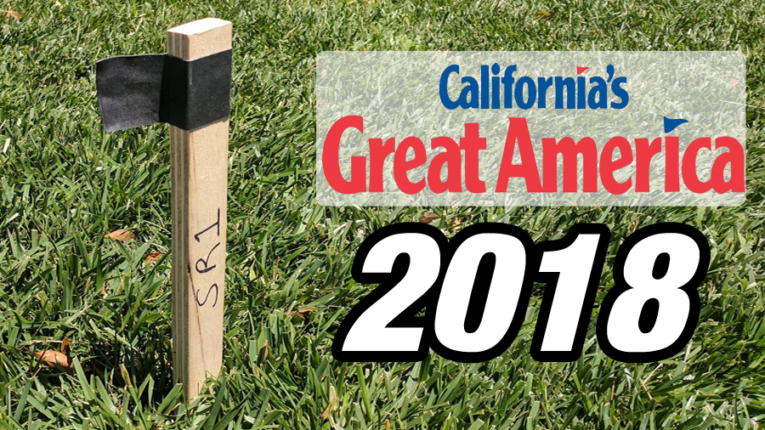 California’s Great America Teases 2018 Addition. Here’s some pretty big news out of California’s Great America. The park is already teasing there twenty eighteen attraction. 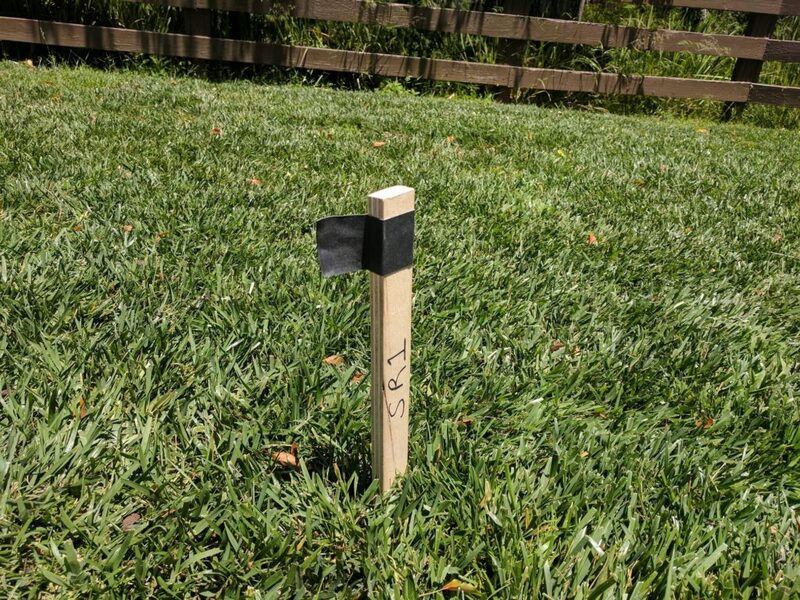 A construction marker has what appear to be white tire tracks leading up to it. Also, the marker itself has “2018” written on one side and “SR1” written on the other. So what exactly does SR1 mean? Well, according to the state of California’s DMV SR-1 refers to a traffic accident report. and this is a ride at California’s Great America after all. Moreover, there’s a couple of car models named SR1; one is a Peugeot convertible and the other is a small race car so this ride most likely has a vehicle theme. 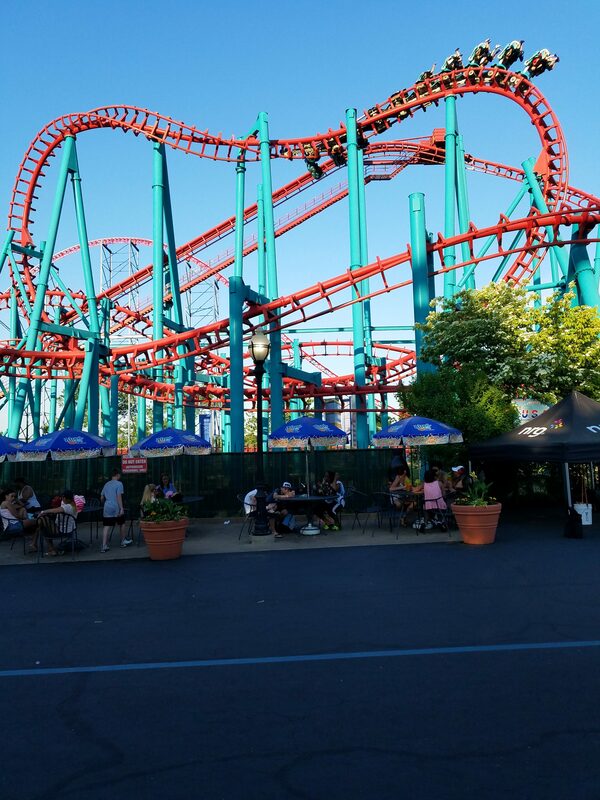 Is it possible that California’s Great America is going to install more souped up version of the Backlot Stunt Coaster? 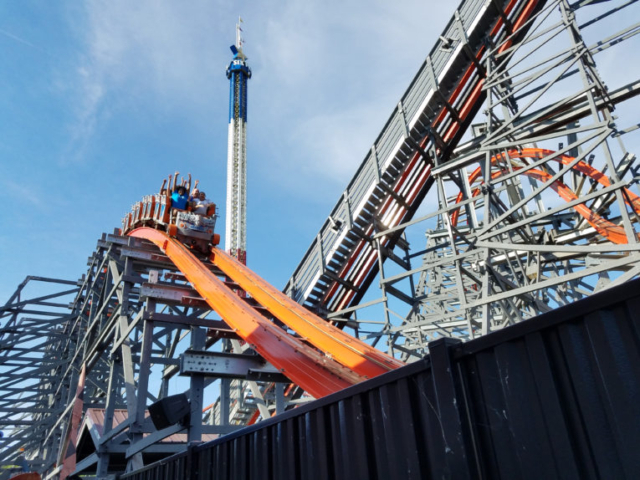 Well, so far the coaster is said to be around twice as tall as the typical Backlot Stunt Coaster, so if it is a similar ride, it will indeed be a lot larger. Intimidator 305, Intamin’s last coaster for Cedar Fair. On one hand, Intamin is a company many enthusiasts would like to see return to the Cedar Fair chain. 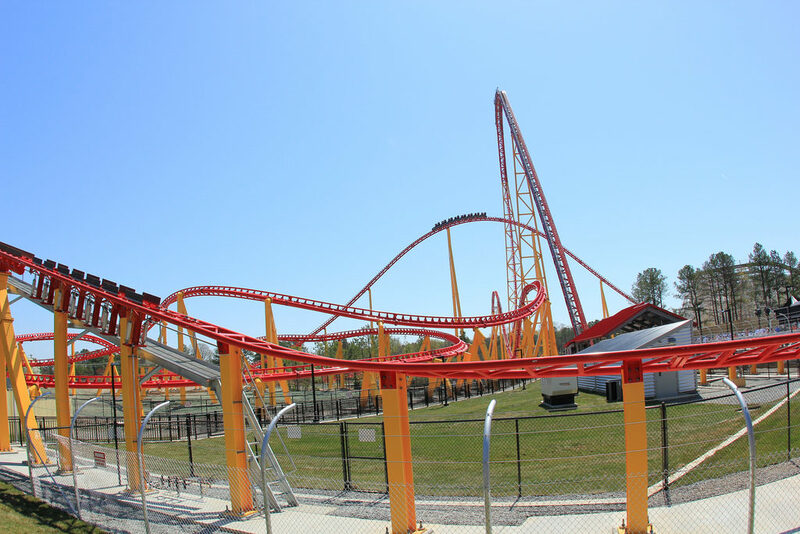 The last time Intamin made a coaster for Cedar Fair was back in 2010 with Intimidator 305 at Kings Dominion. 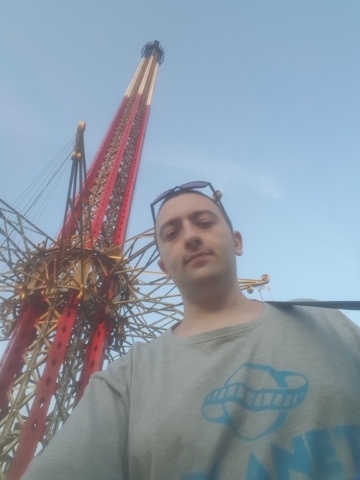 If Intamin is building this new mysterious ride, then what kind of coaster is it? 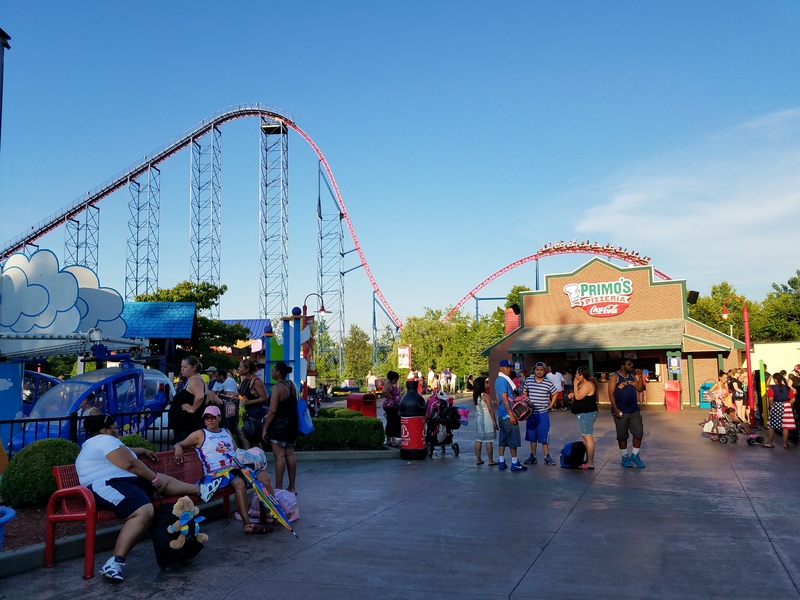 According to documents from the city of Santa Clara, the new coaster is said to be around 110 ft. tall which just happens to be around the same height as Maverick at Cedar Point, just five feet taller. 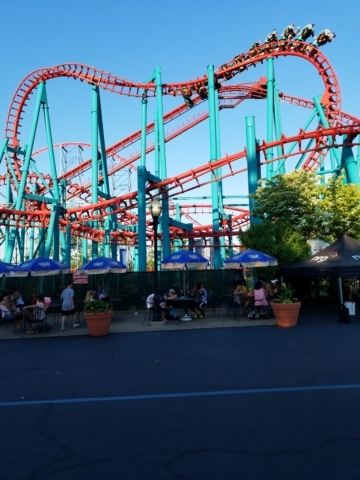 So is California’s Great America actually getting an Intamin blitz coaster? In my opinion, it’s definitely the most likely possibility. 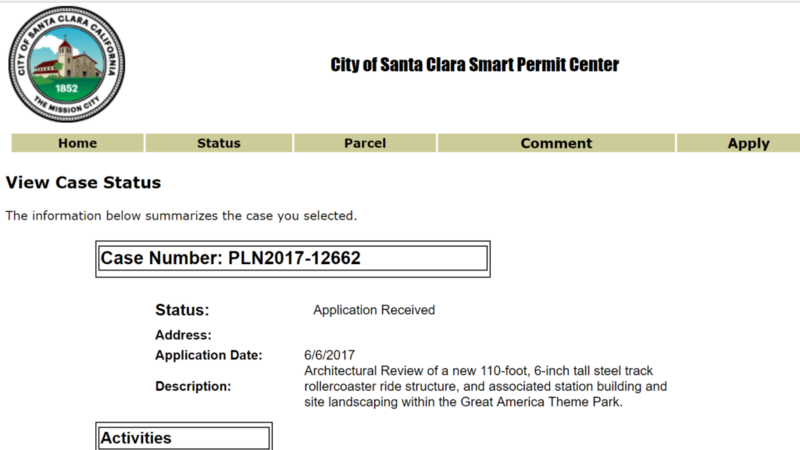 Official permit regarding the coaster. Imagine if Intamin was able to make a bigger and better version of Premier Rides’ Backlot Stunt Coaster. Honestly ,I can already see it being named something like “Road Rage” or maybe it’ll be a more clever name like “Mean Street.” At the end of the day though, this is all complete speculation, and the only way to find out what the park is really adding is just to be patient. 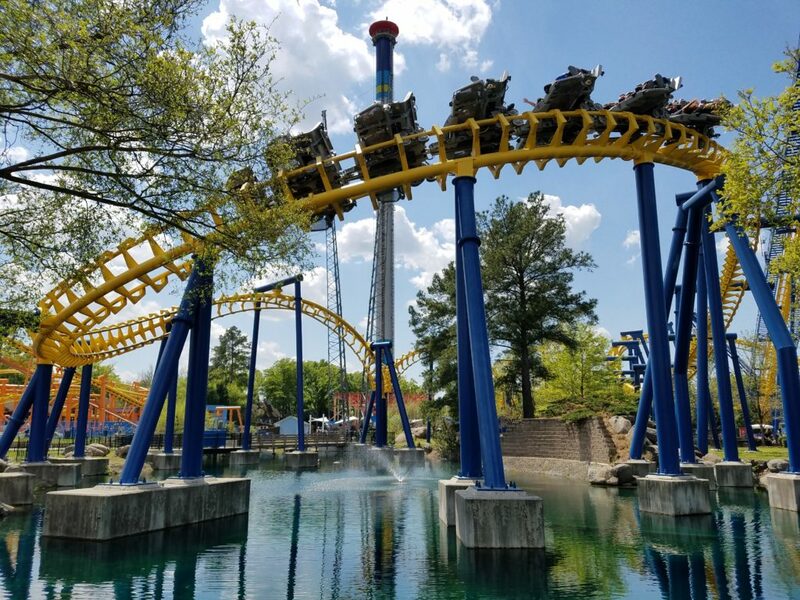 Six Flags Announces 5 Record Breaking/Unique Rides for 2018! The 2018 Hype Train strikes yet again. 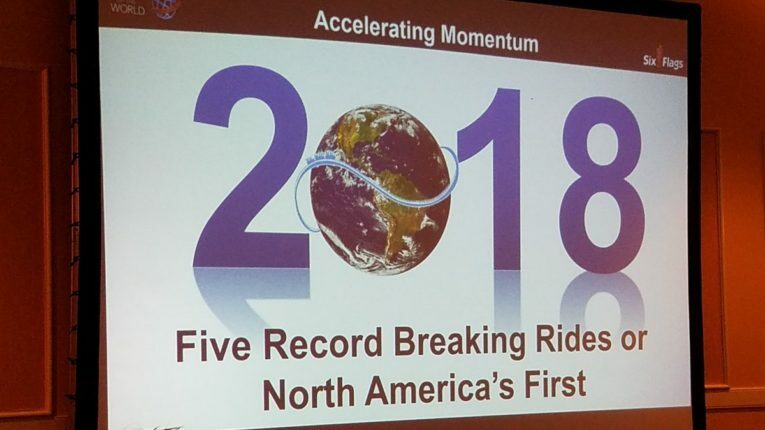 At yesterday’s annual Coaster Con Banquet, Six Flags CEO John Duffy announced that the chain will be receiving five record breaking or “North America’s First” rides in 2018. Now right off the bat, while this announcement is undeniably exciting, it’s also pretty broad. First of all, the announcement doesn’t say if the record-breaking rides will be WORLD record breaking. For example, they could open the tallest waterslide in North America, but it wouldn’t be taller than the Insano Water Slide in Brazil. Also, it’s very likely that some of the new rides, while unique to North America, can also be find across the globe. Overall, the chain’s exact plans for next year are incredibly unpredictable, but let’s take a look at a few possible options. First let’s take a look at some rides that have yet to be built in North America. Considering how Six Flags has worked with Itallian Manufacturer Zamperla in recent years, one very likely addition is a Zamperla Backflash. This is similar to a HUSS Top Spin, but the gondola has an extra axis of rotation. It looks like a truly disorienting experience and right now, there aren’t any built in the United States. Seeing one of these come to a Six Flags park is entirely possible, and would honestly be a pretty cool addition. If one of these does end up coming to the chain, don’t be surprised if it gets a name like Harley Quinn’s Spin-Sanity. Another company the chain has been working with is S&S. 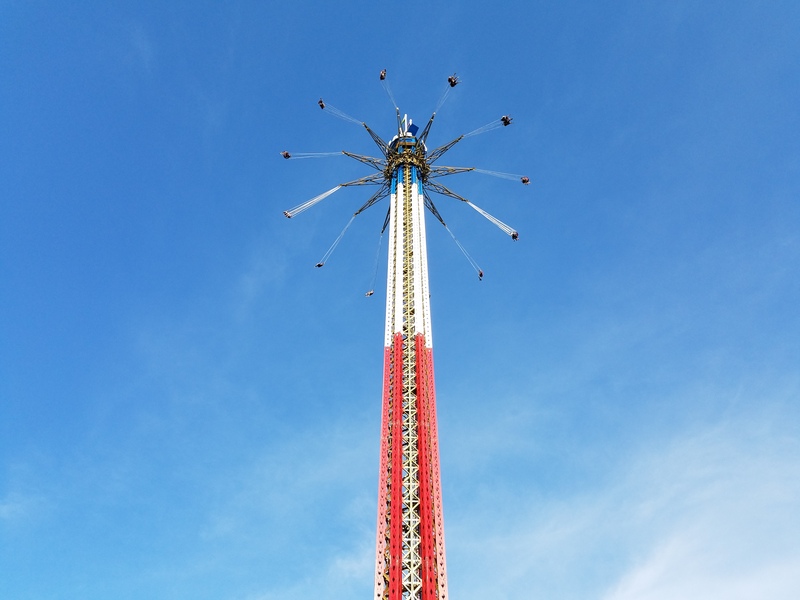 Lately this manufacturer has been on a roll with their new concepts, and their Freespin models have become very popular with Six Flags. 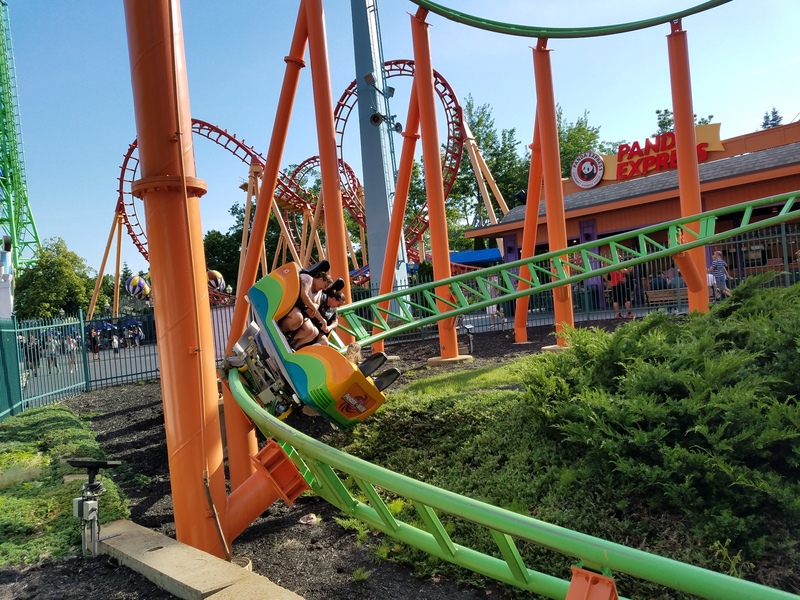 So what other S&S rides could the chain get? One coaster that they could bring to Six flags is the rare Suspended Free Fly model. The only one built so far is Tranan at Sweden’s Skara Sommerland. This is more of a family coaster, but it’s still a very unique ride experience. Six Flags could easily theme to Daffy Duck and put in a Bugs Bunny Boom Town. Could this go to Six Flags Great America? In addition, S&S has several other unused concepts. One concept that especially stands out is their winged looper. 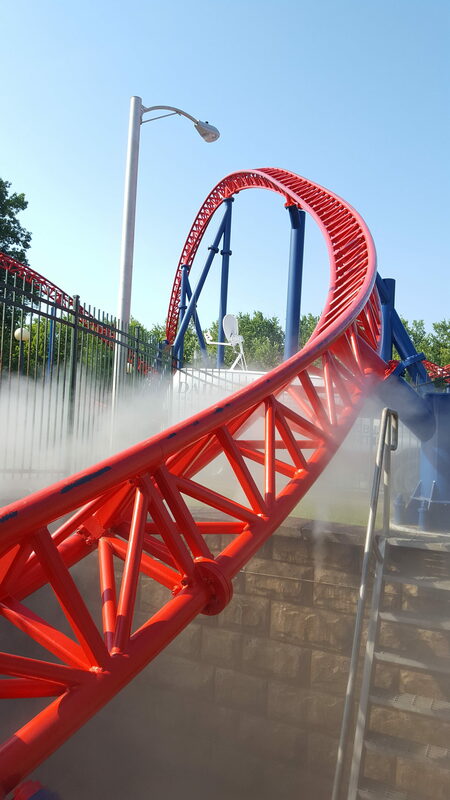 This is like a cross between a Larson Super Loop and a B&M Wing Coaster. This would be a great addition that wouldn’t take up too much space, meaning that it could go pretty much anywhere. 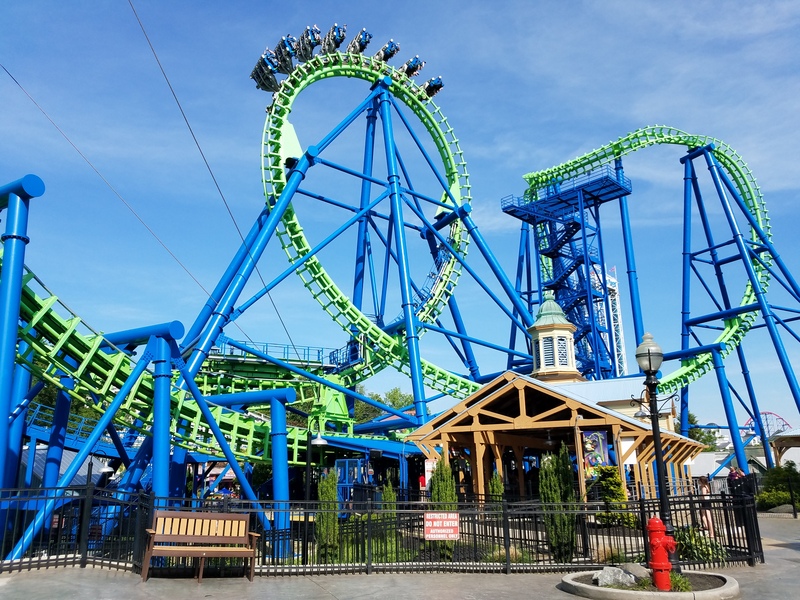 For example, if Six Flags Great America actually ends up removing V2, this could go in its place. 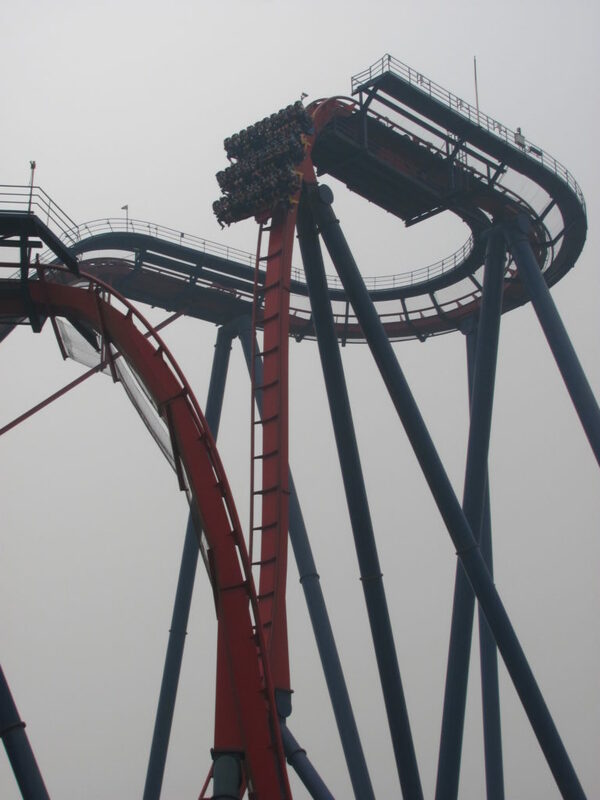 Plus, if they add something like this, Great America would still have a launch coaster, so there’d really be no loss. Moreover, there are plenty of other attractions out there whose concepts we’ve seen at IAAPA, so we could be getting some of those as well. 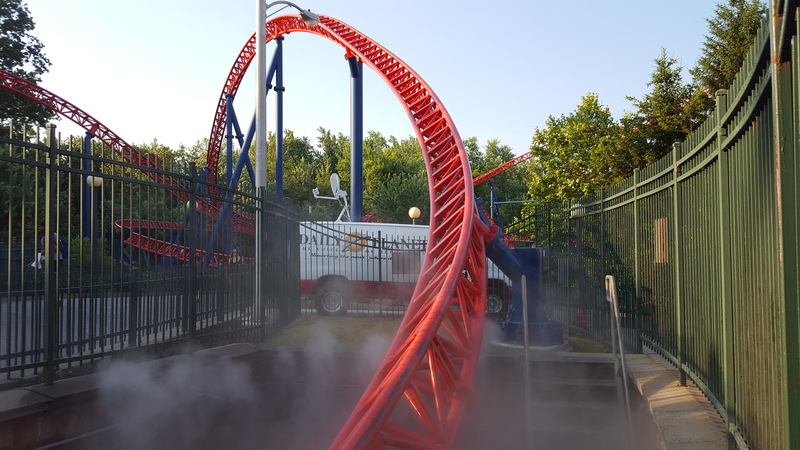 I personally wouldn’t be surprised if they went with this figure-eight style super loop from Skyline; it looks like it has some great potential. Deep Water Dive overlaid onto Waterworld’s map. Moving on, in terms of record-breakers, Six Flags could also bring a record-breaking water park attraction to northern California’s Waterworld, a waterpark they just acquired this year. Now keep in mind that Waterworld is in a pretty tight spot between two rivers and other businesses, so there’s not a lot of room to expand. However, they do have a nice clearing underneath their Tornado funnel slide, so they could totally fit a couple new body slides down there. As of right now, the tallest water slide in North America is the Ko’okiri Body Plunge at Orlando, Florida’s Volcano Bay. This is a massive trapdoor slide that goes straight down and according to Google earth, the clearing at Waterworld would absolutely allow enough space for something like it. To demonstrate this, I superimposed a satellite view of Kentucky Kingdom’s Deep Water Dive (which is just 4 feet shorter than Ko’okiri) over Waterworld, and it indeed fits inside that spot. All they would have to do is make it a foot taller and they would be able to market it as the tallest Water Slide in North America. Dive coaster for Magic Mountain? 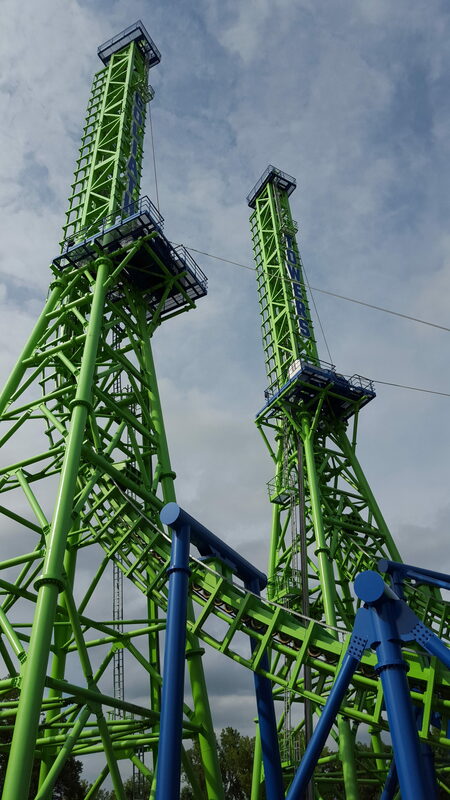 I’ve also heard a few people online bring up the possibility of giving Magic Mountain getting the world’s tallest and fastest dive coaster, and this wouldn’t be a bad idea. After all, dive coasters draw huge crowds and the closest one to Magic Mountain is thousands of miles away at Cedar Point. However, I’m not so sure that they would go with something like this considering Six Flags hasn’t been making such large capital investments for individual parks. I’ve also heard the idea of building the world’s tallest Giant Discovery. However, since all giant discoveries are the same height, they would have to have one custom-built by Zamperla to break this record, and I’m not entirely sure if that’s possible. So to wrap things up, John Duffy’s announcement could mean anything, and it’s still pretty much impossible to predict what the chain will add next year. 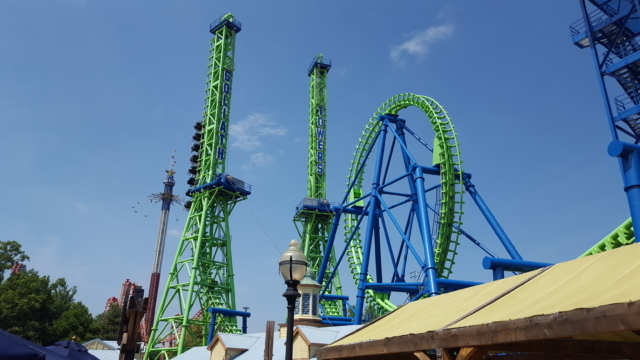 Nevertheless, it’s still incredibly likely that whatever they do get will be solid additions for their parks and things are really looking up for Six Flags. 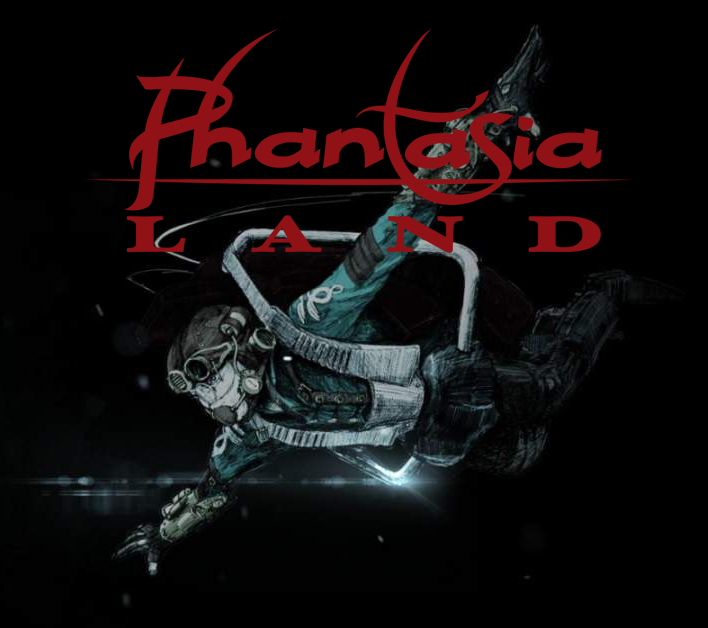 World’s First LAUNCHED FLYING COASTER Coming to Phantasialand. Big news out of Germany: world-renowned theme park Phantasialand is getting yet another major coaster, and this time, it’ll be a “world’s first” attraction. The park released the following video today announcing the new coaster named F.L.Y. It will be the longest flying coaster in the world and is currently estimated to open in 2018. 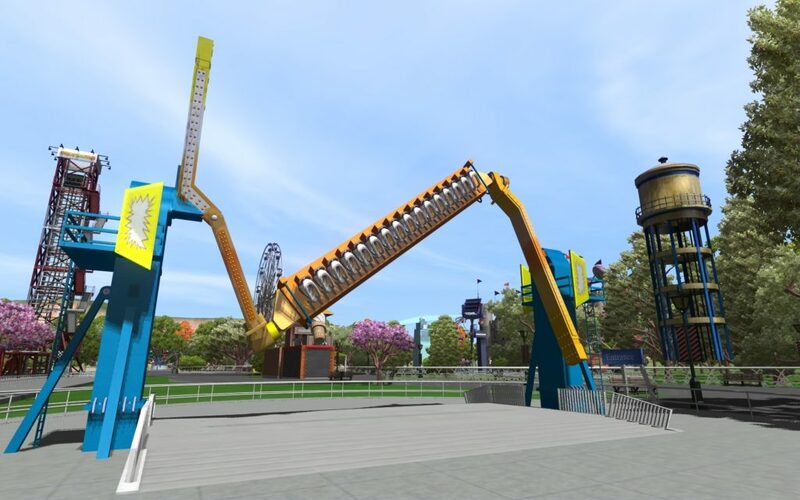 While the manufacturer is currently unannounced, the restraints shown in the concept art match those of a Vekoma Flying Dutchman. 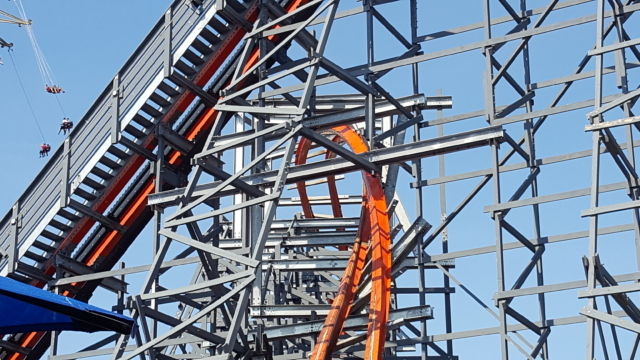 According to Dutch website Loopings, insiders have also claimed that this is indeed a Vekoma coaster. If this is true, this would be the first original Flying Dutchman model to open since Batwing at Six Flags America started operating in 2001. So far, none of Vekoma’s Flying Dutchman models were designed as launch coasters. However, according to the 2006 Euro Attractions Show, Vekoma does in fact have a launched Flying Dutchman model; they just haven’t built one yet. Based on the coaster’s layout, it will start the launch while riders are still on their backs before using an immleman to switch to a flying position. While Vekoma Flying Dutchman coasters aren’t as popular or desired among enthusiasts as B&M Flyers, they can still give great rides. Though I thought Nighthawk at Carowinds was just average, Firehawk at Kings Island really impressed me. 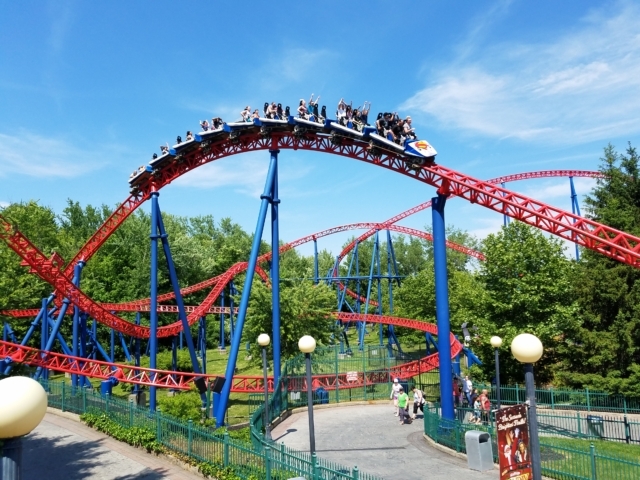 It was an exciting coaster with thrilling inversions and I’d honestly be very interested to see Vekoma take on this concept again. There’s a lot more to Vekoma than SLCs and Boomerangs, you know. However, considering the track record of prototype launch coasters, you might want to watch out for downtime or even a delayed opening before making plans to ride this. It’s entirely possible that Vekoma will get this new model working right off the bat, but the only way to know is to wait and see. Who knows? 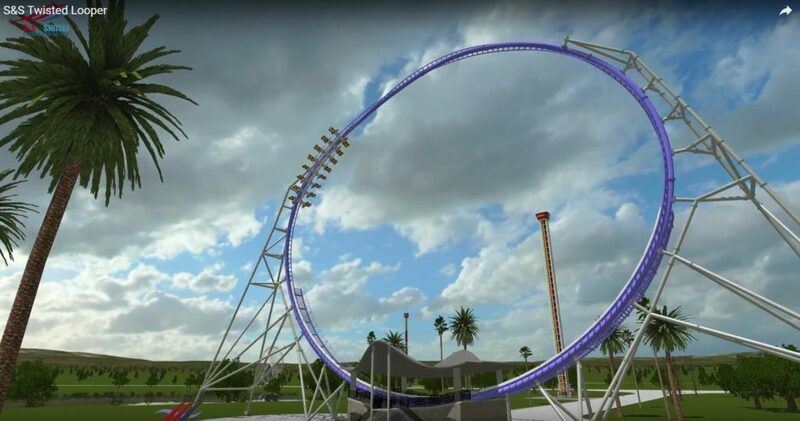 This could end up being the best flying coaster out there. Mine Blower to open on June 23rd! 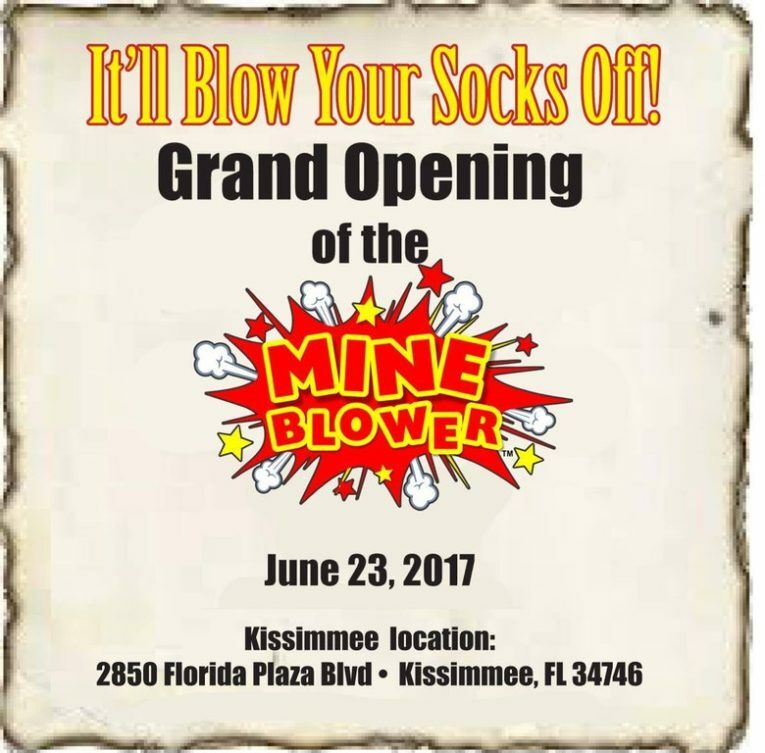 Just in time for the first weekend of summer, Fun Spot Kissimmee’s newest coaster is set to open on June 23rd. The park confirmed this by sharing the image above on social media. 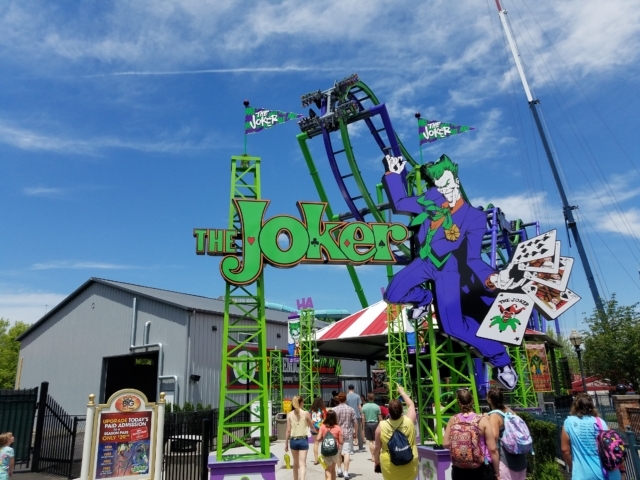 This will be the park’s first roller coaster since 2012 and their first ever original roller coaster. 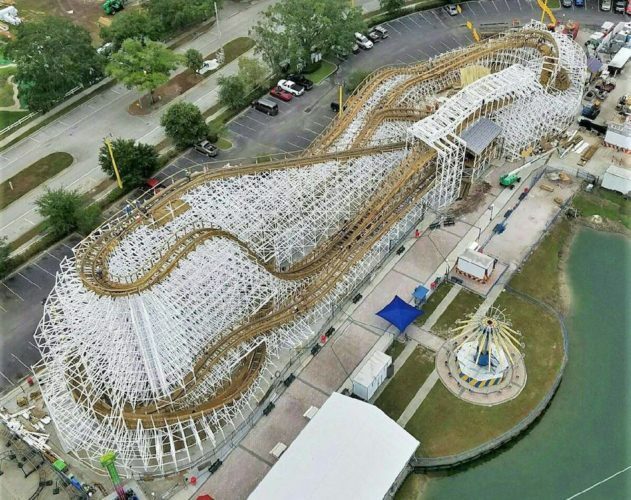 Kiddie Coaster was re-located from Illinois’ Enchanted Forest, and the Rockstar Coaster was re-located from Legoland Florida. 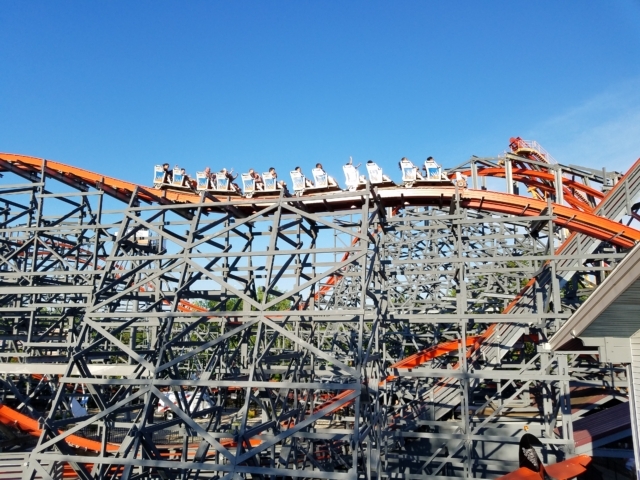 Mine Blower is a very impressive looking Gravity Group wooden coaster that was announced by the park last year. 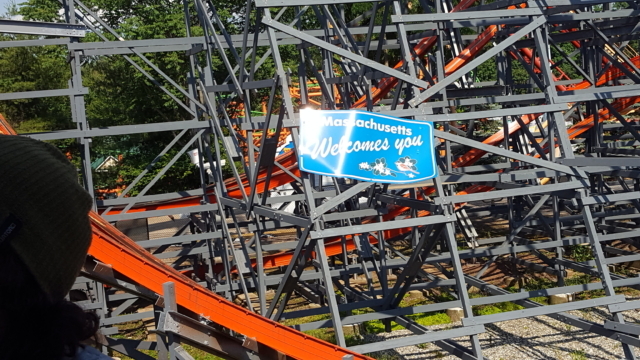 Its most defining feature is a unique corkscrew/barrel roll inversion. 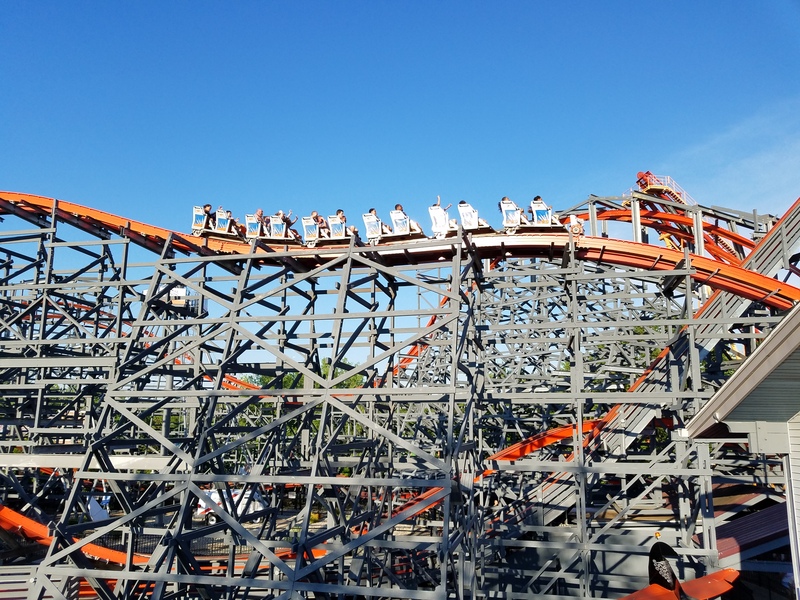 This will be the second Gravity Group woodie in America to have a corkscrew with the other one being located at Wisconsin’s Mt. Olympus Theme Park. I got the chance to visit Fun Spot Orlando last year and had an incredible time. 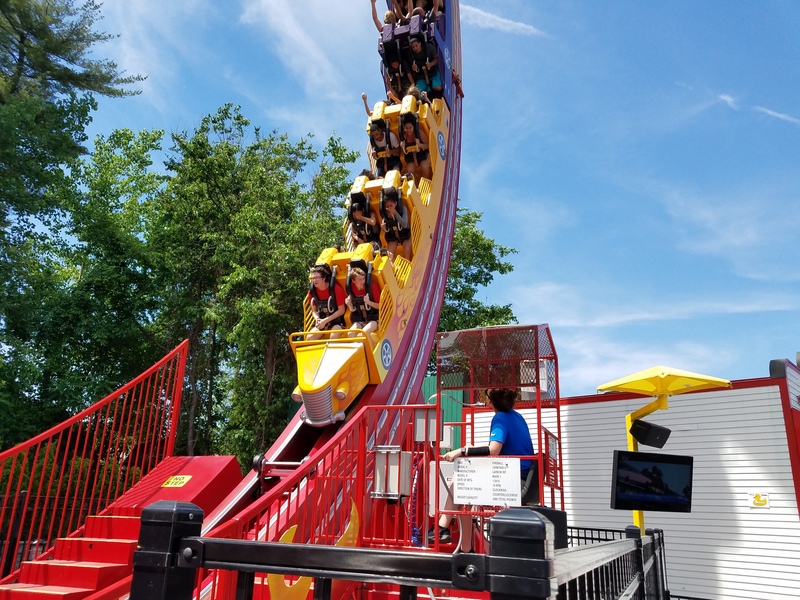 White Lightning was an immensely entertaining GCI and I’m confident that Mine Blower will be another home run for the company. Hopefully I’ll get around to checking it out soon. Here are some of my favorite photos that I snapped at Six Flags New England!